As the sun set on the 1975 season, James Hunt was down and out of Formula One. He had no drive for 1976 and was all washed up. In contrast, Niki Lauda, the new world champion of 1975, was in an entirely different position, with a full year’s contract ahead of him and Enzo Ferrari begging him to sign a new, more lucrative one for years into the future. Lauda was hot favourite to win the world championship again in 1976. No one but no one would have named Hunt as a possible contender, but in a life changing turn of events, Emerson Fittipaldi decided to break his McLaren contract and leave the team. It was the opportunity James Hunt needed and, with the help of his friend John Hogan at Marlboro cigarettes, he grabbed the drive with both hands. Fittipaldi had unwittingly set the stage for the greatest duel in sporting history. The two drivers fought an epic battle for the 1976 Formula One world championship, which, in the end, was decided by a single point over a 16 race season. It was all done in the name of glory. Tom Rubython: Tom Rubython is a well known journalist and author, specialising in the twin worlds of business and sport. Previously editor of well known business and sports magazines including Fomula1 Magazine and BusinessF1 Magazine, he has scored success in books with the best-selling motorsport biographies of racing drivers Ayrton Senna and, latterly, James Hunt. 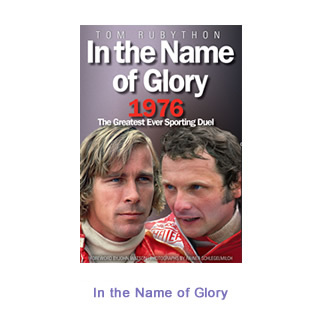 The idea for In The Name of Glory came from his research into James Hunt’s racing career. He believed that the saga of the 1976 Formula One World Championship was much greater than has previously been told. John Watson: John Watson is the most successful driver ever to emerge from Northern Ireland and, during 1976, became one of the top drivers in the sport. He was in prime position to observe that year’s battle for the world championship fought between his two great friends, James Hunt and Niki Lauda. 1976 was Watson’s third season in Formula One and it was also the year when he stood on the podium for the first time and scored his first ever Grand Prix victory, the first of five in his career. During the season, Watson became close to both of the protagonists, James Hunt and Niki Lauda. He actively participated in the rescue of Lauda from his blazing car at the German Grand Prix. Rainer Schleglmilch: Rainer Schlegelmilch began his career as a Formula One photographer at the Nürburgring in 1962, presenting his driver portraits for his final exam at the ‘Bayerische Staatslehranstalt für Photographie’. 18 months later, he opened his photo design studio in Frankfurt. Schlegelmilch’s passion for car photography has led him to more than 500 Grand Prix events. Shooting originally in black and white, Schlegelmilch devoted himself to colour photography from 1970 and his images began appearing regularly in calendars and books. Schlegelmilch’s passion for shooting motor sports continues, and today he owns one of the largest archives on the sport, with over 350,000 images. He has published numerous editorial books on Formula One as well as for brands including Mercedes, BMW, Aston Martin, Ferrari and Porsche.